You know when you’re 10p off of free delivery and decide that your money is better off spent on something fun rather than £3.50 for carriage? Yeah I fall for that little trick every single time. If the silk leopard print underwear I bought for my other half as a joke wasn’t on sale I wouldn’t have succumbed to the ways of online shopping. Damn. I spent a rather long time choosing what product to get. I toyed with the idea of buying a lipstick in a shade I already have around 6 tubes of, I checked out all of the make up brushes but in the end I went for OPI I Mainely Eat Lobster. I must be missing summer judging by all of the coral products I’m buying these days. I Mainely Eat Lobster is a gorgeous bright coral nail polish that just screams warm weather and margaritas. 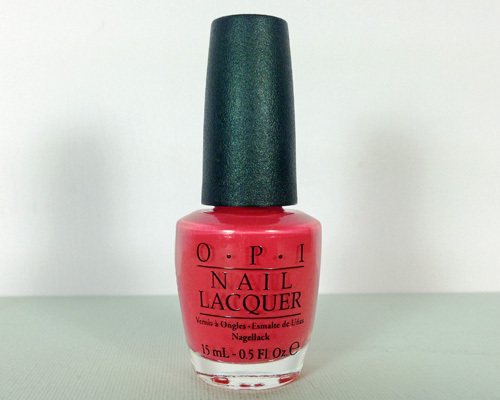 OPI and I don’t always get along formula wise but I’m rather pleased to say I Mainely Eat Lobster is perfect. It’s thick without being gloopy, it’s fairly chip resistant and it dries quickly enough for me to run out the door right after I’ve finished applying it. I’m actually a little confused by the colour of the nail polish. In the pictures it obviously sits on the more pink side of coral but in other lights it’s on the orange side. Basically it’s impossible to describe the true colour of I Mainely Eat Lobster as it will change in different lighting. Let’s just say it’s coral and run with that. I Eat Mainely Lobster is a shade I will be rocking non-stop if I’m not careful. I absolutely love the colour of it and the fact I’m always reminded of warm weather whenever I look at the nail polish doesn’t hurt. Dearest summer please come back so the colour of my nails doesn’t look out of place! If there’s one thing I’ve always wanted to be good at its art. I chose to study it at college but, although I was enthusiastic about school as a small child, I quickly grew out of education during my teenage years and college was a yearlong mistake. I dipped in and out of art every so often after that year but eventually swore off it in 2013. I just didn’t have the patience. September 2014 rolled around and with it came my desire to doodle again. The timing couldn’t have been worse. The days were already growing shorter, my energy was being used up by work and I was completely overwhelmed by the amount of unused art supplies I had lying around. It wasn’t until I stumbled across a sale on rather expensive pencils that I decided to start with the basics and go from there. 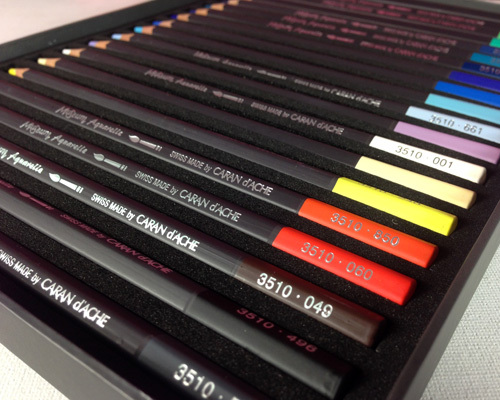 Caran d’Ache Museum Aquarelle pencils are watercolour pencils; something I already have but never quite got around to using. 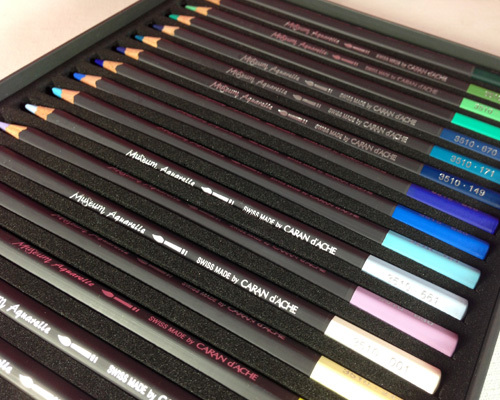 They act as both watercolour pencils and “regular” pencils for your typical doodling fun. 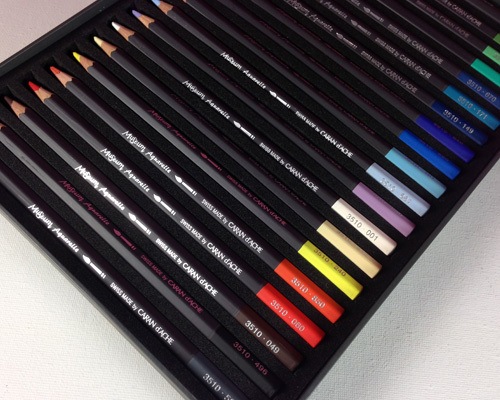 I opted into buying the set with 20 pencils as anything more when I’m barely drawing as it is just seemed ludicrous. I’d love to say I’ve managed to use these already but life hasn’t allowed it. Okay, maybe it has on weekends but I’ve chosen to sleep the daylight away rather than being productive. I do keep thinking about them every so often so the desire to draw is still there but I just can’t seem to motivate myself to pick up a pencil and apply it to paper. I guess I’m afraid of the outcome. My thinking behind this post is if I see the title of it every time I go onto my own blog the motivation to draw will hit me. I already have so many art supplies that have basically gone to waste (they were given to me by the college I attended so the money guilt aspect doesn’t exist) so I really don’t want to add another thing to the wasted list. This has been a fairly random post so I’m going to end it here in order to eat a lot of Pringles without breaking my laptop in the process (why do the crumbs always get stuck underneath the keys?). I really should say I’m going to end this here in order to draw something shouldn’t I? Oh who am I kidding? Pass me the tube that everyone gets their hand stuck in with the delicious crisps inside! The extensive range of MAC lipsticks is so overwhelming it makes me want to run away and cry over how many shades pink comes in. First world problems and all! I swear every time I browse the lipsticks I pick out the ones I already have before giving up on the search for the new perfect lipstick and return to binge watching Ugly Betty. Vegas Volt sort of ended up in my basket by accident; online shopping on a phone is far too fiddly. I’m not exactly one for an orange coral shade but Vegas Volt won me over. 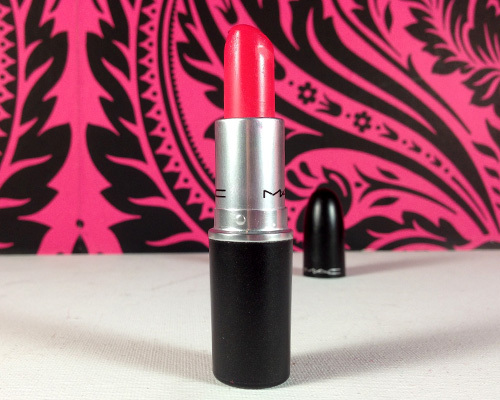 I don’t know if it was because I have fond memories of a coral lipstick that smelt of coconut or because it was different from all of the pink but once I noticed it was in my basket I decided to go ahead and order it. 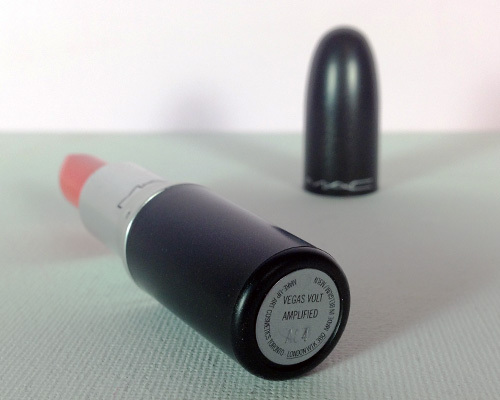 It’s an Amplified formula which is my absolute favourite formula MAC do. 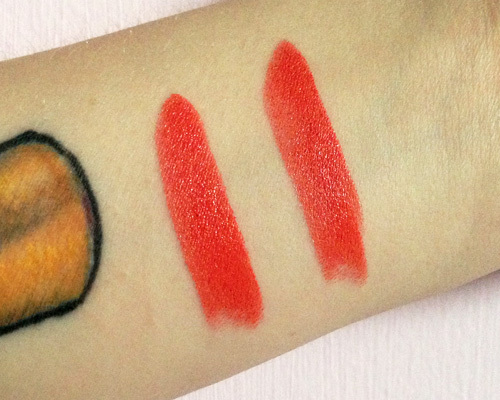 Vegas Volt is very creamy and incredibly easy to apply but it does often border on clown like. Apply this lipstick with a heavy hand and you’ll end up with it absolutely everywhere. Layer upon layer is definitely not my favourite way to wear this lipstick, if anything applying it with a lip brush is the only way forward for me. As it’s a very creamy formula it tends to rub off on everything. My glass, food, toothbrush and even my other half all look fabulous while they wear the remnants of Vegas Volt. If I avoid things that would typically touch my lips Vegas Volt looks great for a good 6 hours. It doesn’t dry out my lips either which is always a major plus in my book. Since it’s an orange-y coral it doesn’t really sit too well with my pale skin. I think this shade would look great on anyone who is blessed with a tan and would suit a rather pretty white dress in the summer; providing you’re not prone to getting it everywhere like I am, I found it on a frigging cushion for goodness sake. It’s just not really a shade that compliments us pale humans. Vegas Volt isn’t going to be a shade that’s on my lips on a regular basis but I know it’ll make me feel very summery and probably make me look very messy whenever I do wear it. Bright colours are really something I should avoid when it comes to lipsticks but c’mon, look at how pretty Vegas Volt is! 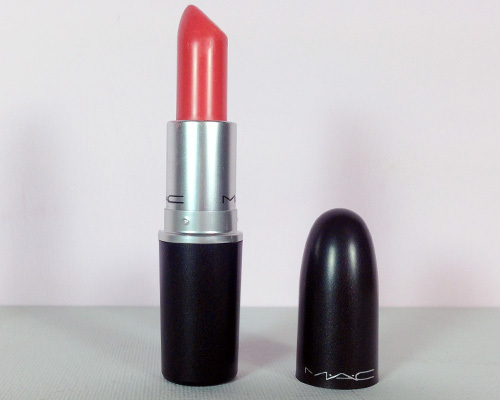 I need more MAC lipsticks in my life! One of my very few blessings in life is my not so sensitive skin. I’ve never bothered using a shaving cream or gel ever since I decided the hairy gorilla look didn’t really suit me. It wasn’t until I was in Lush shortly after reading The Sunday Girl’s post on D’Fluff that I decided I would quite like to slather pink goo all over my legs prior to running a razor over them. 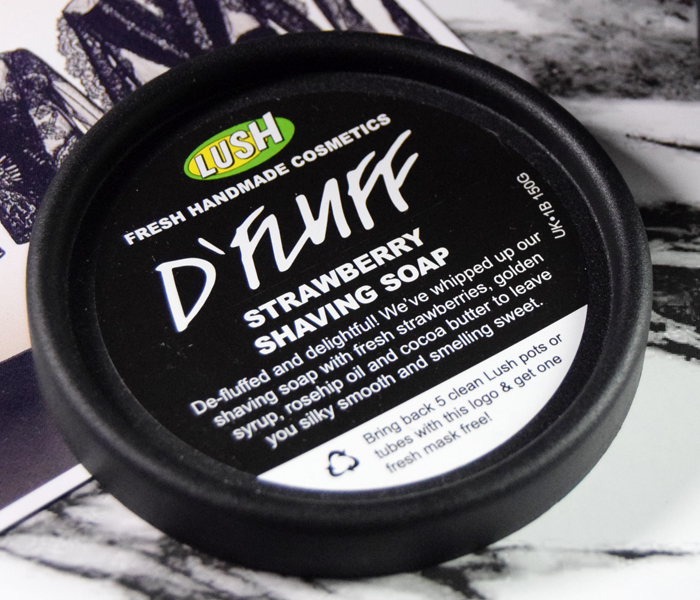 D’Fluff is a strawberry shaving soap that can be applied anywhere you fancy removing unwanted hair. It’s thick, has a mousse like consistency and it always ends up under my nails when applying it. I apply this all over my legs and underarms prior to shaving and it leaves those body parts silky smooth. I rub a very small blob to all of those places before hopping in the shower and shaving away. Obviously I’m not using this shaving soap in the way Lush intended but I can only shave with a decent amount of water falling on my head. Despite only using a small blob and then hopping in the shower to shave there is a major difference to the feeling of my skin afterwards in comparison to shaving without any creamy assistance. My skin is definitely smoother and the unwanted hair stays at bay for longer. I’m not the biggest fan of the subtle strawberry bubblegum like smell of D’Fluff but that scent doesn’t linger around so I can live with it. I think it’s safe to say D’Fluff has converted me to being a shaving soap user. I now refuse to remove any hair that evolution really needs to get rid of permanently without it; in fact, it feels kind of wrong to even think about shaving without D’Fluff. I think Lush has another winner! Go D’Fluff! Is it bad that I’ve been meaning to write this post since August? I’m not even sure better late than never applies here, I think it’s more I’m a terrible blogger. The Jennie’s were my first ever pair of Kurt Geiger shoes and I think they started an obsession. 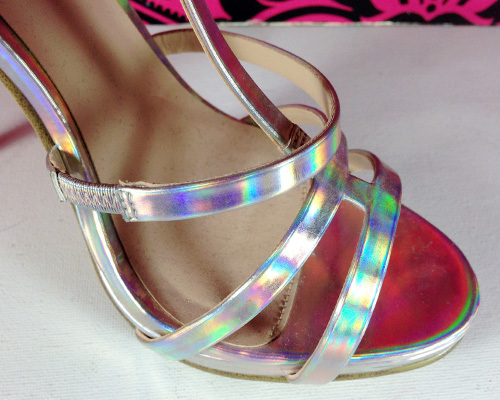 I typically go for bolder shoes so as soon as I spotted these beautiful iridescent babies I immediately snapped them up. I love the simple design of these heels; the T bar makes them a classic style but the colour makes them a little edgier. The finish of the Jennies also makes them good for blinding your enemies in the sun. The height of the heel is 5 inches so, as there’s a very small platform at the front of the shoe, I walk like a wounded duck in them. In all fairness I am used to the ever ugly but very comfortable Jeffrey Campbell Lita rather than the gorgeous stiletto that makes up the majority of Kurt Geiger shoes. Excuses, excuses! 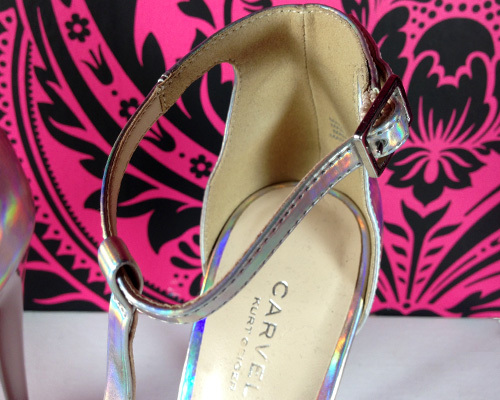 If there is one thing that annoys me about these heels it’s the strap. There’s far too much of it for my fairly small ankles and there are very few holes pierced into the strap to put the buckle into. The obvious solution would be to cut another hole into the strap but I am so uncoordinated I’d probably end up cutting the strap right off. Maybe I could hire someone to do it for me. £5 to anyone who can! Aside from the strap dilemma these shoes are one of my favourite pairs. I love how they can make a plain outfit interesting and how often people look in disgust at them. They’re not the most comfortable heel around but let’s be honest with ourselves, any shoe that puts your feet at a steep angle is never going to be comfortable. Now if you'll excuse me, I’m going to gaze lovingly at these beauties. After 4 years of constantly wearing messily applied nail polish on my fingernails I decided to give the poor stained things a break and I made this decision right after buying 4 nail polishes. Great timing on my part! I’d gone a good 5 months without buying nail polish but I desperately (I really didn’t) needed new shades so I hopped onto Superdrug’s website and happily stumbled across a deal on Barry M. Thanks to the deal, my Superdrug points that are barely anything to brag about and free p&p I scored 4 nail polishes for under a tenner. Feel free to thank me bank account. 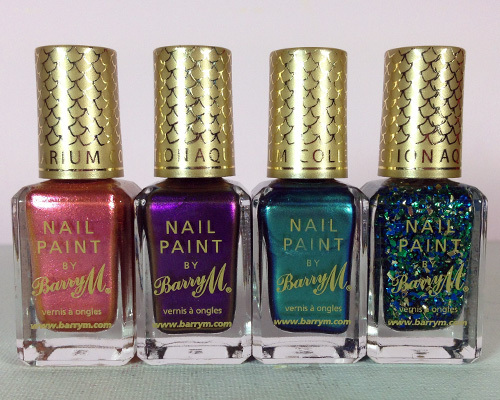 Mediterranean, Persian, Pacific and Mermaid are all part of the Barry M Aquarium collection and I am so late to the scene with these ones! Barry M is usually my favourite brand for nail polishes but I really hate the application of these nail polishes. They’re beyond runny and very sheer so a good few coats is required for full opacity. The great thing about Barry M nail polishes is they do dry quickly which I guess slightly makes up for the amount of effort these require. Despite the state these nail polishes leave my nails in I am beyond in love with the colours. I don’t think I’ve ever owned duochrome nail polishes before so I may be a little more excited than what is socially acceptable (is it even acceptable to be excited about stuff you put on your nails?). I’m just annoyed at my nails for not really being in any state to take more nail polish. 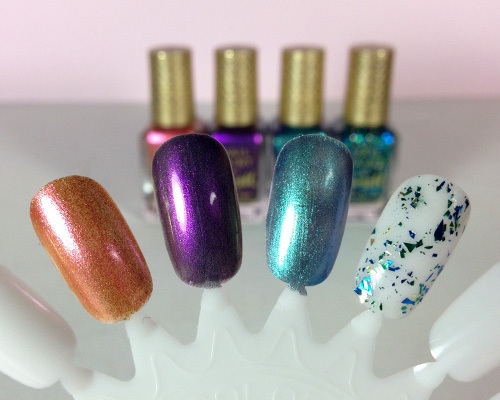 How many times have I said “nail polish” in this post? Dear god. January 5th 2015 was officially my 22nd birthday which is basically a sign that I am getting old. Ok maybe not old but I am not in love with the fact I’ve aged a year. We could get into the whole reason as to why I am not stoked with being 22 but this is going to be a shallow post so let’s not go there! 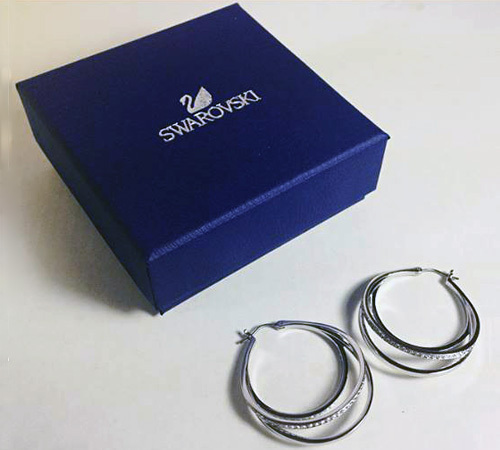 I always pick my birthday present from my parents so this year I requested earrings. I’ve been wearing the same silver teardrop earrings from Tiffany & Co since I was 17 and felt like it was time I got another pair…using someone else’s money. I may have dropped some hints (i.e. I straight out told them) that Swarovski were having a sale and off they popped to Edinburgh. Easy as pie. They were actually already going to Edinburgh for the weekend but let’s pretend they love me enough to go there just for me. It’s safe to say based on what my parents chose that they know me rather well. 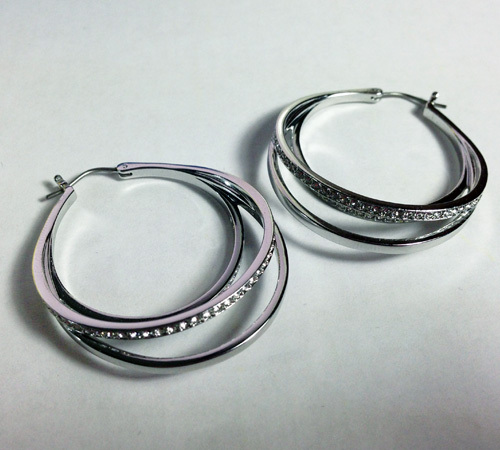 These earrings are the perfect size, they’re not too in your face but they do have a gorgeous little twist along the bottom of 2 of the hoops. I originally asked for gold but as I’m so picky with what shade of gold I’ll wear they chose to play it safe with silver and I’m so glad they did. So you know how Christmas was like 2 weeks ago? Well I’m still talking about it! Christmas is relevant to this post though because it’s all about the Lush box my darling male human gifted me. I haven’t used any of the things in this insanely brightly coloured box as of yet as it all looks so pretty. Seriously, I literally do not want to ruin the perfection of it all. I’m a weirdo aren’t I? Anyway, let’s get into the delightful things that live in this box. Veganese, Dirty Springwash, Snowman and Rose Jam funnily enough all make up the first picture. Dirty Springwash is my favourite Lush shower gel (so far) so I’m rather stoked about this being in the box. Rose Jam is a shower gel I’ve recently purchased so I now have 2 bottles to get through but Vegenese and Snowman are completely new to me. Snowman smells incredible so I can’t wait to use it/accidentally drop it down the shower drain as it’s too jelly like. I had said a few days before receiving the box that I really wanted to try Big and Ocean Salt. The gods of Lush must’ve heard me as they’re obviously in this box! D’Fluff is something I use on a regular basis so I’m rather pleased I have a smaller tub to take whenever I stay somewhere other than my house for a few days. Fair Trade Foot Lotion is another new product to me but my feet are looking forward to a – inadvertent rhyme – treat. King of Skin is one of my favourite Lush products so I was over the moon to find its gorgeous yellowy goodness in the box. 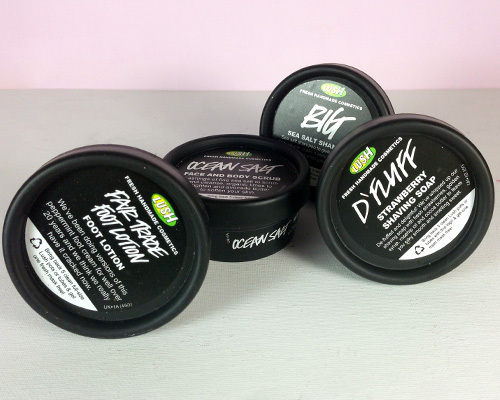 Toothy Tabs, Lip Service, Millionaire Dollar Moisturiser and Snow Fun are again, all new products to me so I’m pretty excited about their inclusion. I’m just excited about everything. Soap! 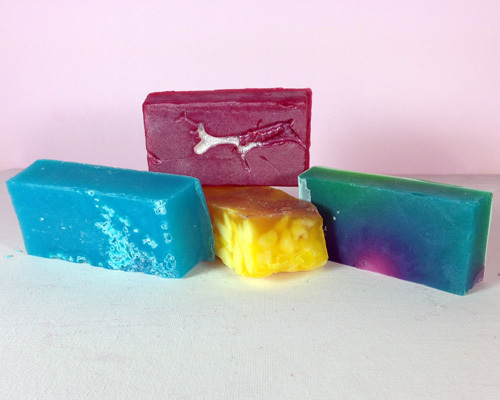 Yes there are 4 bits of soap and they all smell delicious. I typically avoid soap as I spend half of my shower chasing it around the floor so all of these are basically new to me. I have bought Ice Blue and Sandstone for my dad in the past and have been informed that they’re brilliant but Baked Alaska and Reindeer Rock are strangers to me. Hopefully I’ll be able to get through at least one shower without having to chase them around the floor. So there is my perfect rather large Lush box. Now that I have the photos done for all the products I should really start to use them but I want them to look pretty and pristine for as long as possible. This is not normal behaviour! The end of December hit me in the face like a big pizza pie but I came prepared for a change. I must’ve been struck by lightning or it’s a full moon as I have never been so organised for a month in my life. Guaranteed this won’t last. Why do I always start my monthly favourite posts in such an odd way? Let’s just get to the items! Despite the fact it makes me scratch my legs to death I absolutely love this cream. I now use it strictly on my upper body only and it works a treat. 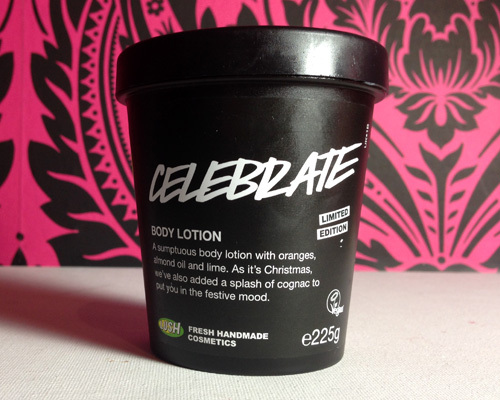 I’m gutted about it being limited edition especially since I was a total idiot and only bought one tub. I really need to start rationing it otherwise the tub will be finished by the end of this month. Boo limited edition products! I totally forgot all about this lipstick until I decided I needed to look presentable while buying shortbread. I found it hiding in between all of my other lipsticks and immediately fell back in love with it. 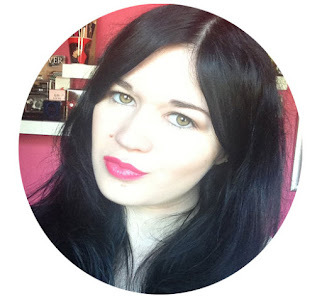 It’s such a gorgeous colour that works brilliantly for both day and night. I did make the discovery that it transfers something chronic when it makes contact with another human though. My other half looked absolutely fabulous while his face was covered in Impassioned so I guess it’s a shade that works for everyone. Another limited edition product from Lush! When I first bought this I really didn’t understand the hype and to be honest, I still don’t get it; it’s a shower gel that smells like bubblegum after all. Despite the fact I don’t understand why everyone is in love with this shower gel I do still like it. 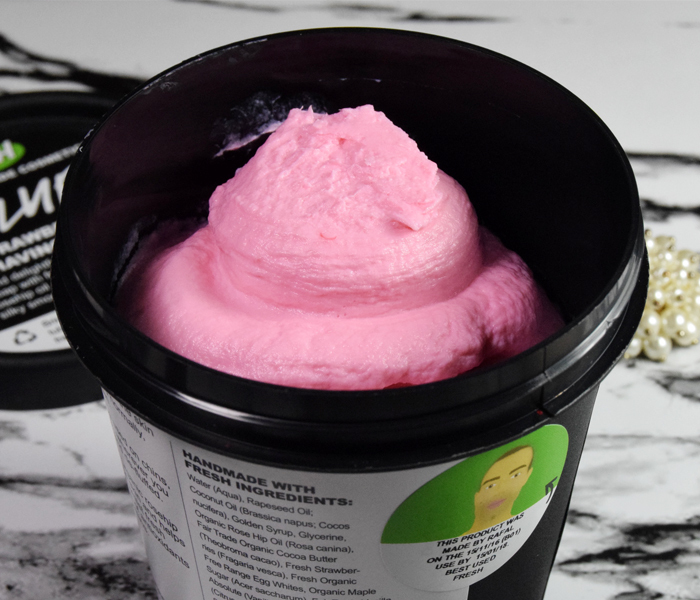 It smells delightful, it’s beyond soapy and bubbly and it’s pink. What more could a girl want? 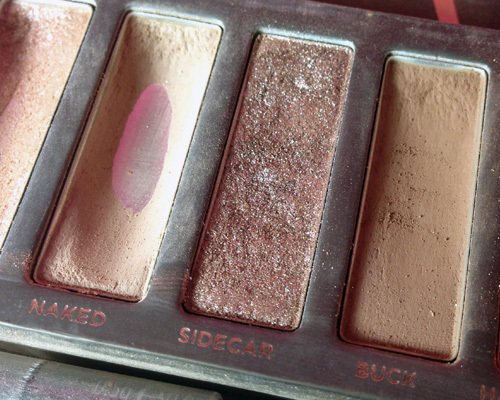 Naked and Buck were my favourite combination when I first got the Urban Decay Naked palette but I left them behind when I got my hands on the Naked 3 palette. I must’ve abandoned these eyeshadows for a good 4 months but I discovered them again out of sheer laziness. They’re now my go to eyeshadows for a basic “I really can’t be bothered but if I don’t put make up on I’ll scare children” look. It's safe to say this is looking a little worse for wear. 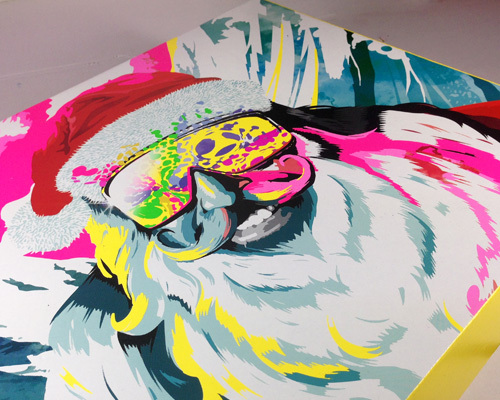 It can’t be a December Favourites post without something Christmassy. I really don’t like Christmas films (Elf makes me want to punch a tree) but there’s something about The Santa Clause that makes me feel all festive and gunk. 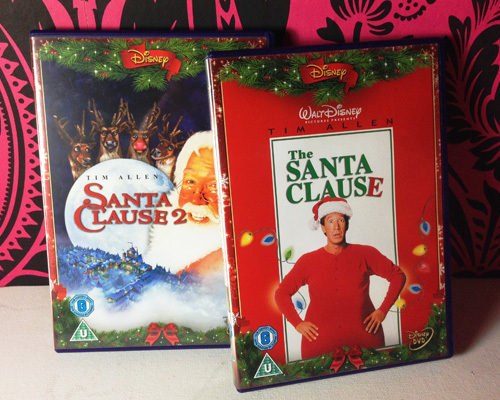 It’s a fairly basic yet heart-warming story and Tim Allen makes a very convincing Santa. I’ve watched it every Christmas since I was a kid but at least now I don’t have a rather disturbing crush on the guy who plays Bernard. So there you have my December Favourites. I was going to do a total 2014 Favourites but let’s be honest, that would just be my monthly favourites throughout the year in one big post. Keeping it short and sweet albeit slightly rambling is much more fun. Right? New Year’s Resolutions are something I always make but never keep. This year I am absolutely determined to stick to them though. These are changes I’ve wanted to make in my life for a while so – here comes the cliché – what better time to do it than a brand new year? I have been a total couch potato all year. In 2013 I started running and was actually doing really well at it but then I just gave up. I tried to get back into it again last year but failed miserably; I just didn’t have the discipline. This year though I want to get fitter as I get out of breath just running up the stairs. It’s not a pleasant feeling! Art is something I love but something I constantly abandon. Again it’s all to do with a lack of discipline and if I’m honest, a severe lack of ability. Drawing doesn’t really come naturally to me and it’s due to a lack of practice. I’m going to try my best this year to not get frustrated when things go wrong and to stick with it. I want to finally be good at drawing and painting. There are so many things that I would like to do but just never bother. I would love to learn to snowboard and go rock climbing (in an indoor arena only, I’m not that daring) but I’m such a wuss and have yet to even attempt these things. Hopefully I’ll find my ovaries and will finally do the things I’m too scared to do. 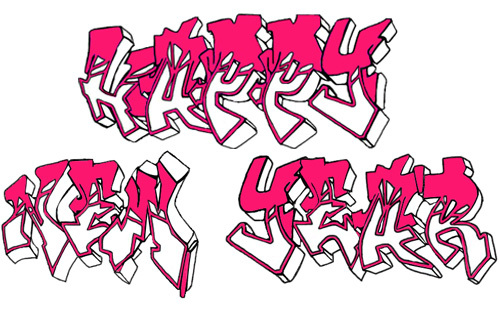 I’m only going to make 3 this year as anymore would be pointless. These are all things I can stick to and can ease myself into too so with a bit of luck and determination I will be the fittest, artiest, daring person to ever grace this earth…or I’ll be able to run up the stairs without getting out of breath, I’ll take either one. Why Are US Prisoners On Strike?